Racetracks are unique places. Tense places. Where to paddock, where’s tech, register now or later. Am I driving down a dead end that I’ll have to back this frickin’ fifty-five feet of truck and trailer out of? Road America was all that in spades, especially since it’s really big. The track is huge–over four miles long, with facilities and grounds that dwarf most tracks I’ve been to, all maintained like a private golf course. As I was pulling into the paddock area dotted with hundreds of big semi-truck rigs and trailers milling at random I spotted a familiar face–Bill Hart on Tony’s Hodaka pit bike. Billy led me to the grassy area Tony had pitted in and I joined them with Nero. I got the trailer set up, extracted Peyote from its tight fit in the back, and went searching for registration. After an interminable tech inspection, I got out onto the track for a practice run. Wow. I felt totally lost. We did five laps and I still had no idea how to drive the track. Not only are there long straights everywhere that you need to carry exit speed for, but most of the corners look alike, so there’s no telling the fast, early apex corners from the slow, late apex tight buggers. I’ve been doing a really lousy job of taking pictures, and I forgot to trigger the in-car video camera at EVERY practice and race, all weekend long–not a single shot. What a knucklehead. But Diane will be with me when I get back to Virginia and she’s the official photographer, so it will get better soon. But here’s a video Tony Drews shot of the track during our Group 4 race (they put Tony in the same group as me because his TR4 has disc rear brakes). Tony Movie And here’s a photo I shot with my cell phone camera of a little town I passed through. I think it was in Montana, but I’m not sure. My cell phone has an amazing camera–5 megapixels and Zeiss lenses. In fact, it’s a really great cell phone in every way– the first one I’ve ever not HATED. If you click on this picture it will go to full 5 megapixel resolution so it will take some time to load, but you might be interested in seeing the kind of photo this N95 Nokia phone is capable of. Went to a restaurant named Schwatrz’s for dinner with a bunch of guys from Friends of Triumph (FOT) and had a great time. Then back to the track and slept in Nero. I had two practice/qualifying sessions. They’ve put Peyote in the Sports Racer class so there’s little possibility of an overall win, so my goal is to beat all the Porsches. I’ve got a long way to go. I’m turning about 2.55 and they’re down at 2.44 but I’m certain I can gain at least ten seconds. I didn’t have an official time because Garmey swapped transponders between my car and Bill Hart’s. Pretty good joke, except timing and scoring, detected the error and didn’t give us times. Billy talked timing and scoring into redoing the time sheets. I did a 2:49. Peyote received a steady stream of visitors in the paddock. The Prodigal Racecar–returning to its home track. If everyone who told me “I used to work on that car, with Bill Ames and Dewey Brohaugh” really did, then neither Bill nor Dewey ever had to spin a wrench. A lot of people were very excited to see the car though. Most of them haven’t seen it run since the eighties when Pat Starr drove it. Pat Starr is actually here, driving his Morgan. There was a Bratwurst & Beans Motrah dinner (Morgan Triumph Healy–there’s a special MOTRAH race here this weekend) dinner Friday night. I love Bratwurst, but I bet I’m going to have had enough of it pretty soon. Kas Kastner gave a little speech, and Jack Drews presented me with the Bill Ames Memorial award. There’s some pretty neat folks that have won that, I’ll have to live up to it. I went to Seibken’s bar afterward. What a place. It reeks of racing and fifty years of guys with motor oil in their veins bullshitting about how fast they are. It was pretty crowded. A group of bachelorettes from Green Bay showed up dressed in whacky wigs, having a party for a bride to be. They were pretty wild and they came to the right place. I hung out for a while and watched the festivities, then gave a ride back to the track to a thoroughly toasted mechanic who was insistent about going to another bar, which fortunately was closed. The MOTRAH qualifying was right after the group four qualifier so I was moved to group three which is the group with most of the Triumphs and other little British cars (LBC). There’s two very fast Austin Healy Sprites in the group so I set off chasing them. I passed one pretty quickly and settled in behind the one in first place to learn the track. I stayed tight on his tail, figuring out how to manage some of the corners that were slowing me. I finally passed him but found I was making serious errors in some of the corners so I tucked back behind him for the last two laps. I turned a 2:44.7. Pretty good improvement, though I think there’s still a couple of seconds of improvement left. We’ll see. If I can pick that up I’ll be ahead of the Porsches in Group Four. I suspect I can do that. Big surprise for them. The MOTRAH qualifier rolled out behind the pace car just as it started raining. I had put my Hoosier DOT (semi-slicks) radials on to try them out on this track–worst possible time to try that. By the time we were coming onto the starting line it was raining steadily, so I pulled off to the pits. No point in damaging the car in a practice session. I have a long way to go. Went to the SVRA dinner. More Brats. Hmm. I went to Seibkens with Jeff Snook and met up with Jon Wood and Keith Files. Wound up going to another local bar, pretty interesting place. Turns out Jon is the original pinball wizard. I left fairly early and hit the sack. I’m on the wagon because of medicine I’m taking, so bars are not as entertaining as they usually are. I tried the DOT Radials during the warm up. Wow. They absolutely rock. I was pretty sure I could pick up two seconds with them. For the Motrah race I was gridded fourth–there were two modern Aero-8 full-on race cars in the first two places. How these guys belong in a Vintage race escapes me. Then the really fast Austin Healy Sprite of Dave Jahamiac, then me. I figured I’d smoke the Healy with the slicks on–wrong. I was very fast in the corners, but he was running away from me in the straights. I finally realized that the bigger rubber was actually slowing me down in the straights. I lost a full second with them on. I also had a nasty vibration near top speed that suddenly would quit when I reached max speed… I was only getting to 6400 RPM at the end of the straight instead of 6800 as I was earlier. Jahamiac was able to pull away from me as we climbed the hill of the front straight even though I had higher exit speed on the last corner than he did. The bottom line was I was getting better cornering ability but the increased friction of the tires, and perhaps their underinflation, was slowing me where it really counts at Road America–in the long straights. I felt kind of stupid about shooting myself in the foot like that. I finished third–behind the two Morgans and Jahamiak. I consider that second since the Morgans don’t count any more than an F1 car would if it were stuck in this group, but they were fun to see on the track. They awarded prizes for the first finisher from each marque–I was the first Triumph, so I won a really nice Seiko Chronographic watch. I was really pleased to get it. I have a few nice watches, and I rarely wear them, but I’ve been wearing this watch all the time, ever since I got it. As I understand it, Joe Alexander and Alexander Racing donated the watch, so thanks Joe. When we got the race results I realized Jahamiak probably would have had me even without the tire fiasco. My best time with Speedsters was 2.44.something, he was doing 2:43’s. In the group four race I changed back to Hoosier Speedsters and even put an extra pound of pressure in each to reduce rolling friction. I was gridded about mid-pack, behind all the serious sports racers but ahead of the other production-based cars. At the green flag I charged into the middle of the sports racer pack, passing a number of cars. I expected a number of them to come barrelling by after we got through the first turn, but they never did. It turned out that my most aggressive competitor was a Lotus Super Seven. He and I battled for the lead in our private little race, swapping a number of times. He finally faded back–I think he overcooked a corner, and I was able to pull a reasonable lead and hold it to the end. I finished first in my class–which wasn’t very hard considering I had about fifteen seconds a lap over the next car in the class–and about seventh overall. I accomplished my goal of beating the Porsches. After the races, I Loaded up Peyote and headed for Virginia. Before I left, Kas Kastner loaned me a set of lectures on CD, one set on Ancient Egypt, the other on Ancient Greece. Kas told me that the Egyptian one was really good, so I popped in the first lecture, assuming that I’d swap to something more entertaining as the night wore on and I needed stimulation. As it turned out, the lecturer is tremendous and the subject is fascinating. I listened to 28 of the 40-minute lectures by the time I got to VIR. Monday morning I got rolling bright and early. Ate a bowl of cereal in the truck and craved coffee until I stopped for Diesel and filled up my mug with hideous dreck. It’s not easy to get a decent cup of Joe. I rolled on south, learning about the dynasties of Egypt and sliding by identical strip malls, one state to the other. I finally reached West Virginia and as I climbed one of the rolling hills I saw a tire carcass in the middle of the left lane. I was safely in the right lane, but along came a pickup doing a good 80 MPH and ran right into it, flinging it against the trailer. It hit my grey and black water drain pipe a hard blow and then slid backw to my power cord storage box, wiping it off the trailer. The box and the power cord were dragging behind the trailer so I pulled over into the breakdown lane. There was precious little room between the breakdown lane and the traffic, so I was in a tough spot to work. I jury rigged the power cord, threw the box into the trailer, and made my way to an exit. At the exit, it became clear that the drain pipe was knocked loose from the tanks somewhere. Not good–it’s a lot of work to access the tanks. I reinforced my jury rig and made some more miles, finally stopping in a KOA campground about a hundred miles from the track. I got the trailer hooked up, dumped the tanks, and refilled my freshwater tank to see if it had any damage (nope). Then I reworked the electrical connection so I don’t need the box. I spent a comfortable night, got back on the road early, and made my way to VIR. I had made arrangements to leave the rig at the RacePlex at VIR while I flew back to Portland for my nephew’s graduation. The VIR Gold Cup isn’t until June 8-10. The plan was that I would fly out on Thursday, which gave me a fair amount of time to work on Peyote. I wanted to track down that nasty vibration. But now I also had to work on Nero. I spent some time assessing the damage to the waste tanks and determined that I couldn’t tackle the job in the time I had available. So I buttoned it up and got to work on Peyote. 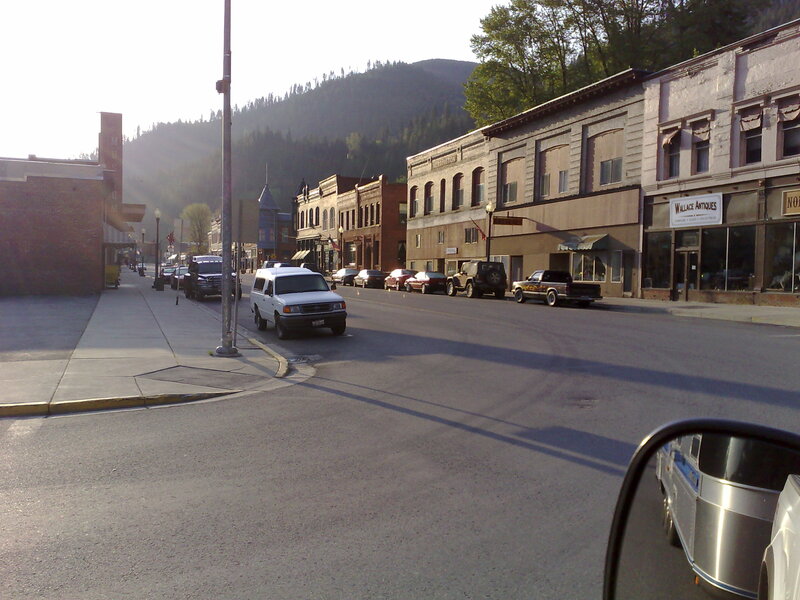 I suspected the problem might be the driveshaft, so I put the car up on jackstands, pulled the driveshaft and all four wheels, and headed for Danville–the nearest town. In Danville I found a good tire shop that could check the balance of the tires and learned that there wasn’t any driveshaft service shop in the area. The tires were way out of balance, and the driveshaft looked fine as far as my visual inspection by feel was concerned. So I decided to put the car back together and see if I could get back to Portland a day early. When I got back to the track I remembered that the seal on the input shaft of the rear end was leaking a little, and I knew I had replacement seals, so I decided to replace the seal while I had the driveshaft off. I pulled the seal and discovered that my replacements were the wrong size. Since I couldn’t reassemble the car without the seal, I decided to bring the driveshaft back to Portland and get it checked out. I loaded Peyote back into Nero, tossed all the loose parts into it, cleaned up and headed for Raleigh-Durham airport. I had a flight out the next morning. I did a drive-by of the airport to see where I had to go in the morning and figure out the parking situation. I needed to leave the truck for two weeks–I didn’t want to do that in some short-term lot. The Raleigh-Durham airport turns out to be one of those multi-mega cloverleaf nightmares–I had no idea where I was going. Even the GPS was lost. I finally gave up and found a nearby Marriot to spend the night. I figured they could tell me how to handle the parking. Imagine my surprise when they told me I could leave the truck there for free, and they’d shuttle me to the airport! What a great service. After a restless night, I caught my plane to Cincinnati and then on to Portland. Uneventful flight except they wouldn’t let me bring the driveshaft in my carry-on (it’s short enough to almost fit in my daypack). Apparently bludgeons are a concern. Whatever, I went back to the desk and checked it through to Portland then worried all the way about what I would do if it didn’t make it. I should have measurements of the closed and open lengths of the driveshaft so I could get it duplicated, but I don’t. It’s not a stock triumph one–it’s been shortened at least ten inches. Fortunately, it made it to Portland without drama. Read magazines, watched half of a really bad movie (Catch and Release), ate rubber chicken. I was very happy to be home and see Diane. I took the driveshaft down to Driveline Services who quickly determined that it was ready to come apart like a cheap suit. One yoke was totally hosed, the bearings were starting to brinell, and the caps were rotating inside the yokes. Good thing I didn’t have the right input shaft seal or it would have probably come apart at VIR. There’s nothing more than a little aluminum between me and the driveshaft. I might have to look at that. I have all the parts ready to go back on the car, including the right seal. I also turned out a tool on my lathe to make replacing the seal a more precise job. 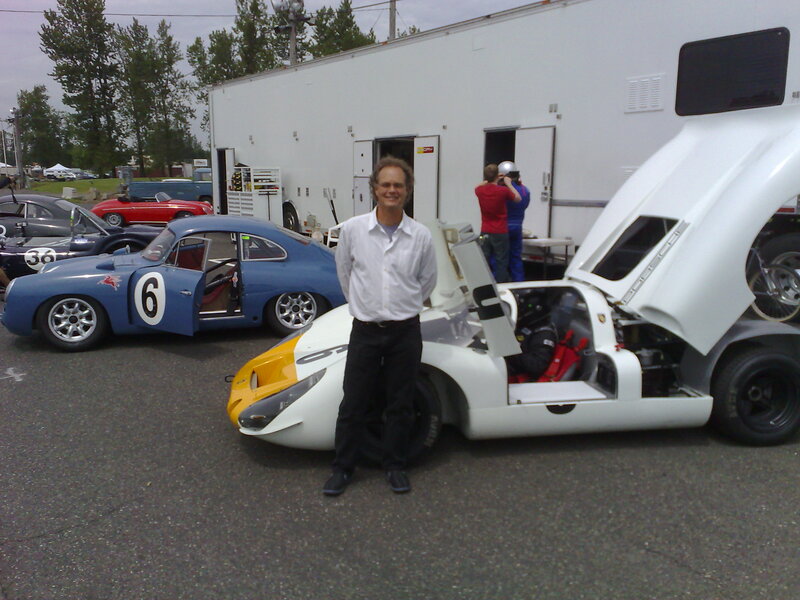 On Friday I went to PIR to watch my friend Cameron Healy drive his new 906 Porsche at a Lotus Club track day. What a great car. Cameron’s going to have a fine time with it, I’m sure. Cameron and his new toy. I’m still figuring out how the autofocus works on my phone’s camera. Saturday we met Cameron and his wife Suzy at Scott Paul winery in Carleton, OR. A small winery he’s a partner in. They make great pinots and import fine burgundies from France. Had a nice picnic with Cameron and Suzy, tasted some nice wines and called it a day. I’m spending the week until we get back on the road cleaning up my shop. It’s a nearly hopeless task, but I’m chugging away at it. I’ll start posting again once we’re on the road. Until then, be safe, have fun, don’t fight.